Summary: Hannah Cho and Nick Cooper have been best friends since 8th grade. They talk for hours on the phone, regularly shower each other with presents, and know everything there is to know about one another. Review: I requested this ARC because I thought it could be a fun story—some of my closest friends are people I met online, and some of those friendships have since transferred from online only to “real life.” I was certain that throwing romance into the mix with a heavy dose of Las Vegas would make things even more exciting. Instead, the first chapter opened on a sour note it never quite recovered from when Hannah, the Korean-American narrator, spent a great deal of time complaining about how Aditi Singh (presumably another girl of color) “stole” a student government trip that should have “belonged” to Hannah even though it is implied the trip is merit-based and Aditi’s application was the better one. Unfortunately, Hannah continues to pit herself against basically every girl in the story, from her sister, Grace, to her best friend, Lo, to Nick’s girlfriend, Frankie. It gets particularly bad when Frankie is in the picture as Hannah can’t seem to comment on Frankie’s appearance without snarking about the size of Frankie’s breasts or being horribly jealous whenever Frankie comes in contact with her boyfriend. Hannah’s possessiveness over Nick—who isn’t her boyfriend and whose affections she shot down prior to the start of the story—becomes frustrating in short order when it is constantly accompanied by petty commentary about Frankie and isn’t alleviated by the rare moments when Hannah admits there are good points about Frankie. There are also a few moments re: race that gave me pause, such as Hannah’s description of herself: “[breaking rules] goes against my Good Korean Girl DNA. Rules are made to be followed—at least that’s what my parents, who aren’t Tiger Parents or anything but are still pretty serious, drilled into me starting the second I learned to crawl.” I was also unimpressed with how close Lo came to several negative Latinx stereotypes. It felt like the author had tried to write racially diverse characters but didn’t understand how particular character traits/plot points could become harmful stereotypes when applied to characters of color. The plot itself is a frustrating cycle of will-Hannah-confess-or-not, with her constantly convincing herself to say something and then either getting interrupted or running away from the opportunity. While there are some fun moments between her and Nick, they are undercut by the constant wheel-spinning, and Nick’s not-quite-ambiguity about pursuing something with Hannah despite having a girlfriend already made it difficult to root for the couple. Recommendation: Just skip it. 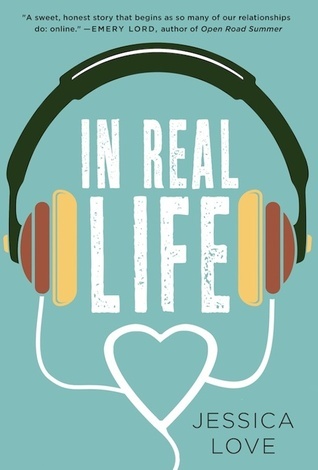 While there are a few good moments, In Real Life is overall an unsatisfying and frustrating read.